Neurons learn, and you will gain a first look at this by examining a sensory neuron's adaptation to a constant stimulus. In this experiment you will be introduced to new types of science equipment such as manipulators and microscopes, and you will learn that neurons constantly change their response properties. SpikerBox - You should become familiar with how to use your SpikerBox. ...that then synapse with specific parts of the brain on up to the neocortex (wrinkly part of the brain). These are exquisite maps of your body, and you have many of these, such as maps for visual fields, hearing space, the position of your limbs, and more. But, as you know from our human behavioral experiments, over time your body gets used to stimuli. You are probably aware of the clothes on your body the moment you put them on, but rather quickly you unconsciously ignore the constant presence of cloth on your skin. We can argue the chief responsibility of a neuron is to "learn," or change its response properties depending on the conditions it faces. You brain learns, and it learns quickly. That's what it does. This can happen over the long term (learning to speak a different language) and over the short term (learning to ignore background noise). Though the mechanisms of learning are still a subject of healthy and active research (for example, we still do not know how declarative memory is stored in the brain), we can investigate this short term effect of "adaptation" using the cockroach leg preparation. 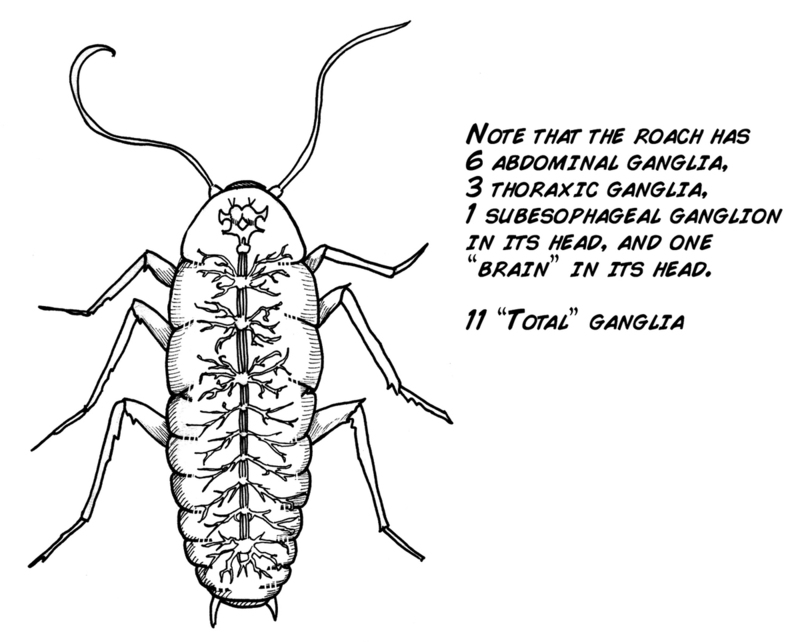 The cockroach has a peripheral system, where neural input from its limbs is transmitted to its central nervous system of ganglia along its ventral nerve cord. 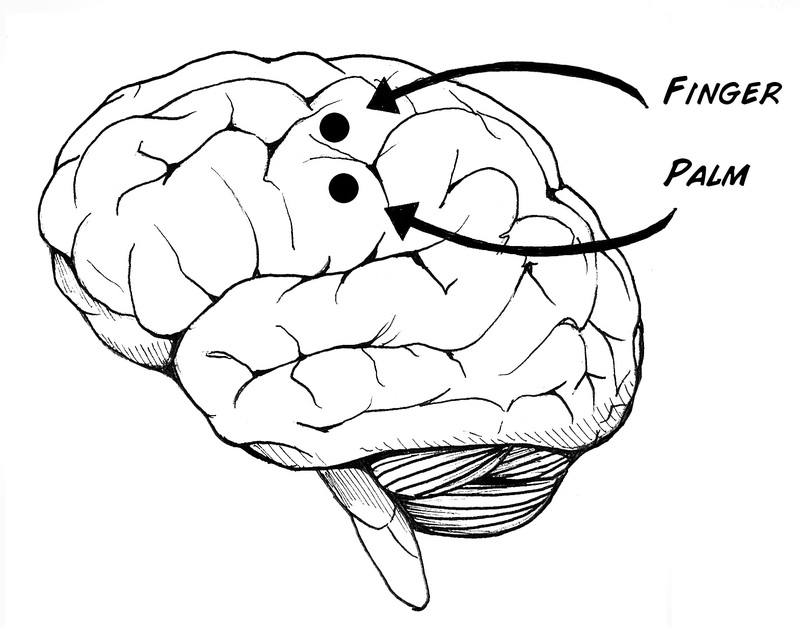 You may think sensory adaptation occurs at the ganglia level, but it can actually happen in the first sensory neuron! We will measure this adaptation effect by carefully manipulating the touch sensitive barbs on the cockroach leg. For this experiment, we need to precisely place fine wooden probes directly on the sensory barbs of the cockroach under magnification, so we will need to use our Manipulator and RoachScope. 1. In this experiment, you will be putting a cockroach leg underneath our RoachScope. Apply a piece of cork underneath the lens of the scope, plug the RCA end of your electrode cable into the SpikerBox, and your needle electrodes into the cockroach leg as shown below. 2. Turn on the SpikerBox; as before, you should hear a robust spontaneous spiking activity. 3. Plug in your Smartphone cable into the SpikerBox and your SmartPhone. Note: you may want to split the output of the SpikerBox so that you can hear the spikes at the same time. 4. Turn your smartphone's camera app on and put it in movie mode. 5. 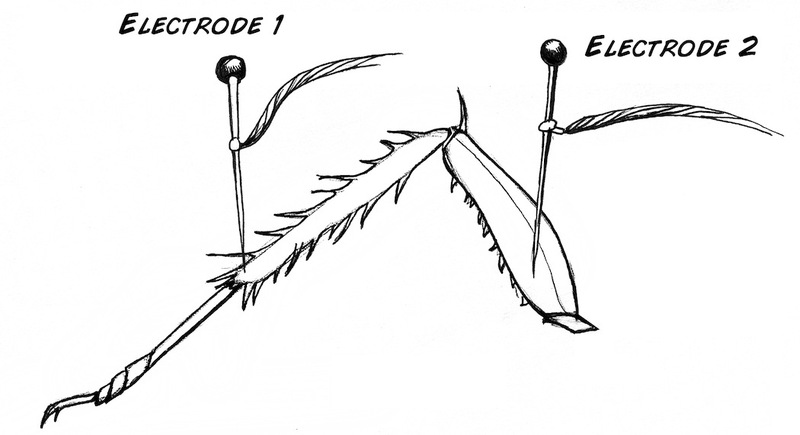 Now, place a toothpick in your manipulator, and position the toothpick, with your manipulator, over a spine on the leg of the cockroach (Note: you may want to touch the barbs with a toothpick by hand first to find the barbs that are most sensitive). 6. With your manipulator, touch the sensitive barbs. You should hear a massive discharge of spikes that then goes away within a couple seconds. You can have your labmate time this by hand, or you can extract the audio recording from the movie file for more rigorous analysis. You can then measure the adaptation time using our new "Backyard Brains Spike Recorder" PC software as we did in the video above. 7. Repeat with a number of barbs. Do the times for barb "adaptation" differ among different barbs? Try removing the toothpick and then immediately placing it back on the barb again. Is the adaptation time quicker or slower? Do you think certain drugs will lengthen the adaptation time? It's not only the barbs that are sensitive to touch, but also the exoskeleton of the leg itself. Try probing different parts of the leg and measuring if the adaptation times are different. We can't we do those experiment by hand? 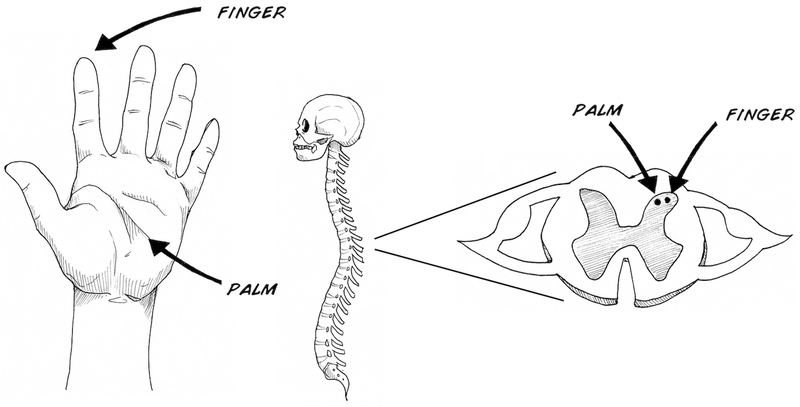 Try very precisely positioning the toothpick with your hand, and measuring the adaptation time. It should appear to take much longer. Do you have any ideas as to why this might be so? 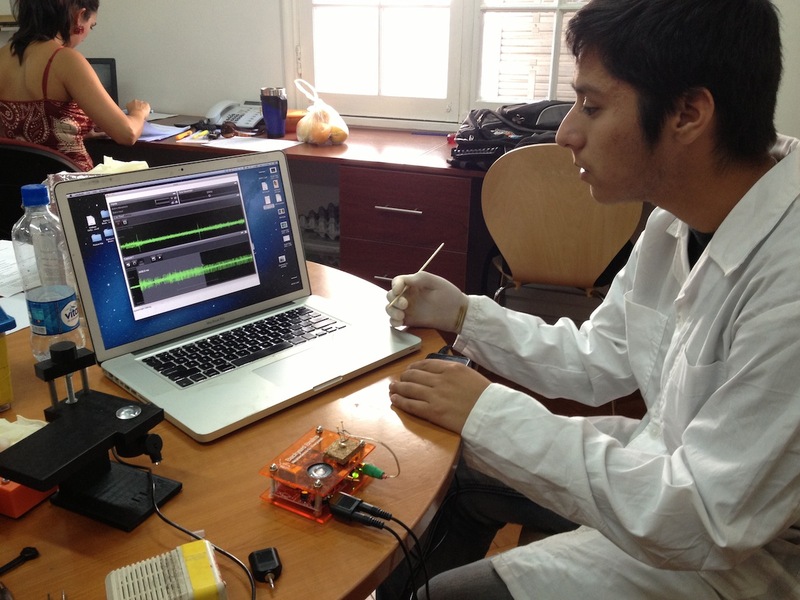 Gracias to Carlos Burgos Gutierrez, high school student at Liceo Japon in Huasco, Chile, for helping us collect our first preliminary data for this experiment. It's The Backyard Brains 10-Year Anniversary!